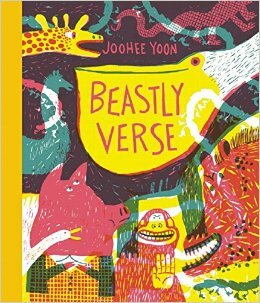 This is a wildly glorious collection of poems about beasts of various kinds, written by an assortment of well-known poets, and illustrated using three-colour screenprint technology on satisfyingly fat matte paper, and with a delicious yellow cloth spine. This is a very special book. 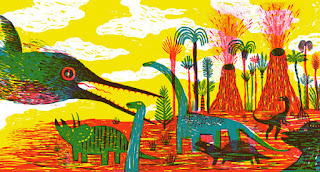 Designed and illustrated by JooHee Yoon who is a prodigiously talented young illustrator and printmaker with a great list of clients including The New York Times, The New Yorker, the Boston Globe and NPR. Have a look at her tumblr blog for some examples of this work. She has a nice stash of awards so far too. 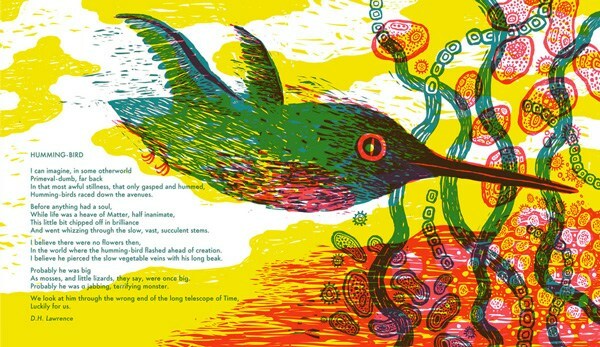 The illustrations that accompany the poems are eye-popping, and all the more astounding when you discover they are created with only three colours of ink - cyan, magenta and yellow - vivid and glorious and layered to create secondary colours. It looks rather kaleidoscopic as the shapes and colours overlaid reveal other shapes and colours behind. To add to the colour trickery there are a number of gatefolds which open out to reveal further details. William Blake's 'The tiger' shows only the back 2/3rds of the beast until you open the page up to reveal his anxious face. The most startling though is 'The Hummingbird' by D.H. Lawrence where the flap opens to reveal an entirely new form of hummingbird - with sharp teeth swooping in to attack dinosaurs. 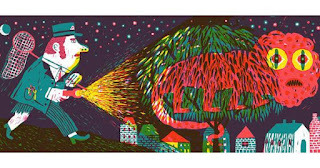 My favourite poem in the collection has to be the wonderfully titled 'The Spangled Pandemonium' by Palmer Brown, with the challenge of creating an image for this imagined animal, revealed in the dark by the zookeeper's torch, supposedly fierce but looking rather wretched. This collection, with its menagerie of creatures, real and imagined, and its vivid colours and strong mark-making, is perfect for use in the classroom too. I'd love to see what readers would do given the chance to illustrate their own creatures using this layering technique, and discovering the magic of the blended colours. 10/10 for me. The copy I'm looking at is from the library but I will certainly want to own this one. check our the Brain Pickings article about the book, which is where I first found out about it. Also worth a look is Joohee Yoon's own website.